Jana Johansson, postdoc at the Department of Environmental Science and Analytical Chemistry (ACES), has received the Early Career Scientists’ aerosologist award for the best thesis of 2017. Jana Johansson works within the field of contaminant chemistry and in her research she focuses on perfluorinated alkyl acids (PFAAs), chemicals that have been detected even in remote areas such as the Arctic, although they are predominately used and emitted in industrialized countries. In her doctoral thesis “Sources, transport and fate of perfluoroalkyl substances in the atmosphere” she tried to determine the main sources of atmospheric PFAAs and how the compounds are transported in the atmosphere. The work has now been awarded a prize as the best Ph.D. thesis of 2017 by the Nordic Society for Aerosol Research (NOSA). “During my time as a PhD student I noticed that there is quite a big divide between contaminant scientists and aerosol scientists. As a result, our view of the atmospheric transport of pollutants is sometimes overly simplistic. To address some of the questions which have remained unanswered in my field during the last decade, I collaborated with scientists from the ACES atmospheric aerosol unit. Receiving recognition from the aerosol community has encouraged me to continue this work as part of my post doc”, says Jana Johansson. NOSA has established the Early Career Scientists’ aerosologist award for outstanding PhD dissertations in order to recognize and encourage high quality research. The award was distributed for the first time during a recent conference in Helsinki (NOSA-FAAR Aerosol Symposium 2018, 27-28 March) and will be awarded annually to one newly graduated PhD from now on. “I believe that her pioneering research on sea spray aerosol transport of pollutants is worthy of the Early Career Scientists’ aerosologist award. 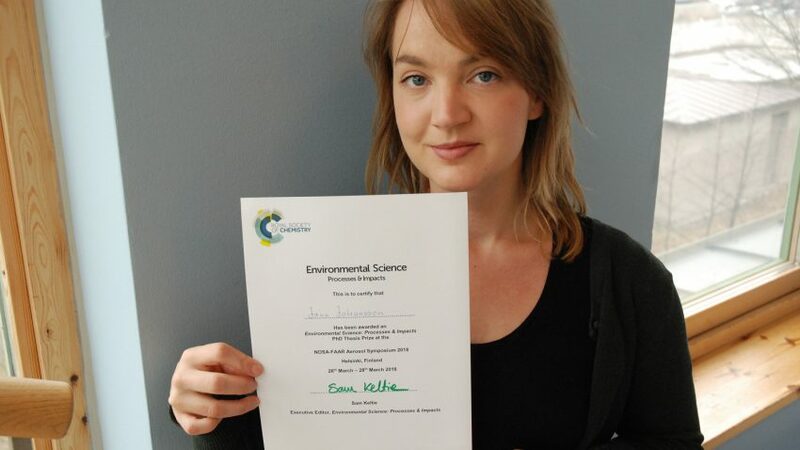 Particularly impressive was Jana’s handling of the interdisciplinary collaboration between atmospheric physicists, environmental chemists and mathematical modellers”, says Ian Cousins, Professor and group Leader at ACES who nominated Jana Johansson for the prize. The purpose of NOSA is, among other things, to promote aerosol research and to promote re-growth and education within aerosol sciences. Jana Johanssons PhD-project was funded by Formas.